The world's foremost "style" hotel brand of Starwood Hotels & Resorts Inc. (www.whotels.com/seoul), W Seoul-Walkerhill's restaurant Kitchen is having an event presenting especially themed dishes matched with wines for only 24 people. The event, "Place 24" is prepared for our guests who are looking for 'luxury casual' of W hotel and quality wines. Coming soon "Place 24" is the third of its series that is regularly placed at restaurant Kitchen and will be presented with theme of "A Taste of Spain." The previous events held in March and May respectively were prepared for maximum 24 people to provide opportunity of tasting special dishes and wines. 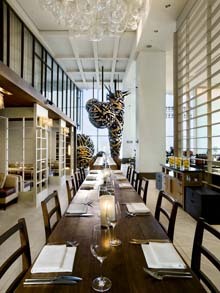 While maintaining the luxury casual atmosphere, the event has created the unique Spanish cultured menu with quality wine which were bottled in. It will be held on 4 June. Starting with cocktail reception at WooBar and the event will be continued at 24-seating Gathering Table of the Kitchen. The menu will contain Spanish Tapas Selection and stuffed Baby Squid, Chorizo, Garlic & Tomatoes with Castillo de Mont Blanc, Barbera 2006 and Serrano Ham Wrapped Pork Tenderloin, Chick Pea Pancake, Aged Sheery Jus with Castillo de Mont Blanc, Barbera 2006. A variety of cheeses from Spain — Manchego, San Simeon, Sant Mateu, Valdeon — will go with Clos Mont Blanc Premium Merlot, Barbara 2004. For finale, and churros and chocolate with tea or coffee will be prepared. In addition, small gifts will be given to the participants and also entertaining time will be programmed. In June, the start of summer 2008, Why not try having an awesome dinner time in early June gathering with attractive people and enjoy chef Ciaran's Spanish cuisine and carefully matched Spanish wine. From W Seoul's Place 24 at Kitchen, refresh your early summer night in Seoul.